Ham and cheese may be sure to please, but would you believe mushroom cap burgers will too? Whether you're cutting back on bread for calories purposes or have celiac disease, it's time to shake up your summer sandwiches by saying good-bye to the bun. As a mom to children with celiac disease and peanut allergies, Miriam Pearl knows all too well the challenges of creating fun, flavourful and safe dishes for her loved ones. "I have made it my business to provide healthy, delicious safe-to-eat foods and to educate those who have gluten intolerance and allergies," says Pearl, who founded Delicious Without Gluten, a peanut/nut free and gluten-free factory that ships healthy and allergy-safe foods to Ontario and Quebec. In the slideshow below, Pearl shares nine gluten-free sandwich ideas you can pack for a picnic or everyday lunch. 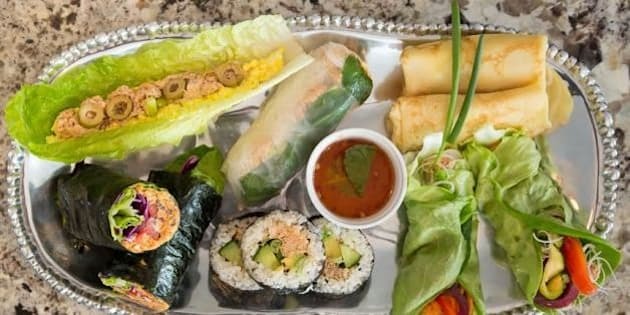 From lettuce wraps to nori rolls, these recipes prove going bread-free doesn't have to be boring. But if you're still dreaming about sinking your teeth into a soft, fluffy roll, we've also included gluten-free bread recipes that cover everything from tortillas to crepes to traditional loaves. Get the recipes in the slideshow below and let us know what your favourite gluten-free bread is in the comments below.